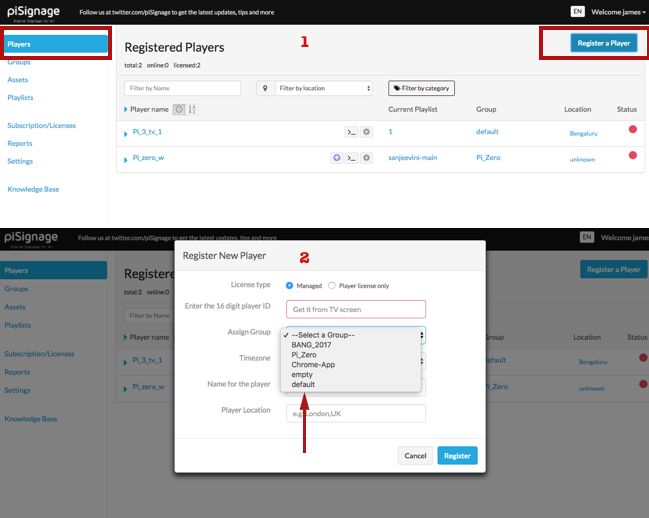 Every Time you register a player in your piSignage account, it is assigned to a group, The Default group, unless you specifically assign the player to any group. You can create any number of groups as per your requirement. The Advantage of GROUPs here is that any change made to the GROUP will be reflected in all the PLAYERS belonging to the group, saving you from the work of having to operate each player individually. Select a Default playlist for the all players belonging to the group. Include Additional playlists and schedule their time of display in advance. Select the ticker for the group players. Edit other Group Settings like playlist Animation, Asset Stretch , TV Schedule OFF etc for players belonging to group. We will learn about group settings and controls in detail in another writeup. Thus the players are always controlled through groups even when you have only one player playing particular playlist. This feature will be of great help when you want additional screens displaying similar Information as all you need to do is assign the player to appropriate group. Let us simplify this even more in explaining the group feature with a simple example of a Restaurant Digital Signage. 3 screens displaying information like Restaurant Timings, Nutritional information & other generic informative content, to engage the waiting customers. For this you can create 2 groups, name them say Group-Menu and Group-Info for easy identification. Assign appropriate playlist for each Group and associate each of the 6 player to Appropriate groups. Now All the 6 screens can be controlled via 2 Groups. 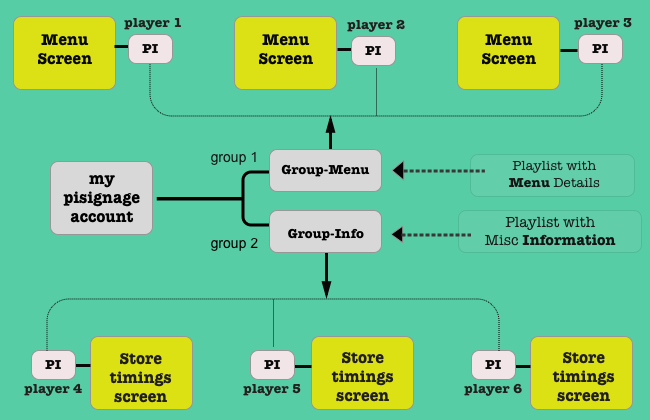 A Simple Infographic Showing the Group, Player, Playlist structure in piSignage. The example is of a restaurant having 3 screens Displaying Menu and another 3 screens displaying Store timings and other miscellanious information. Similarly If you have a network of screens at different cities and each city has unique playlist, All you need to do is club the players of a city into a single group. The groups are hugely beneficial while controlling large network of screens , with multiple screens displaying a Identical content.Explore our Blog for more piSignage features. Every registred player is has to be assigned to a group. If you have multiple screens where each single screen displays different content, make a GROUP with a single player. Keep your Screen Fresh with rolling News feeds. You can keep your screens fresh with scrolling/sliding text tickers using RSS feeds with piSignage RSS Feeds are provided by all the Global News Sources like BBC,CNN, Sky etc to name a few.